A warm welcome to all! It has been some time since I last created a career thread, mostly as I have struggle for time to play FM, what with family commitments and full time. However I am now six years into my current save which I am enjoying immensely and I would like to share my progress so far, and hopefully future achievements too with you. I'm playing as David Beckham, I used the in game editor to assign him his correct information such as international appearances, favoured and disliked personnel etc. Thus far I have had quite a successful career, it started out as a nationalistic challenge with Man United but has developed beyond that. During my time with United we won the Premier League twice as well as the 2017/18 FA cup but I was unable to deliver any continental success, reaching the semi-finals of the Europa League in 2016/17 and the last eight of the Champions League the following season, being eliminated by Inter and AC Milan respectively. 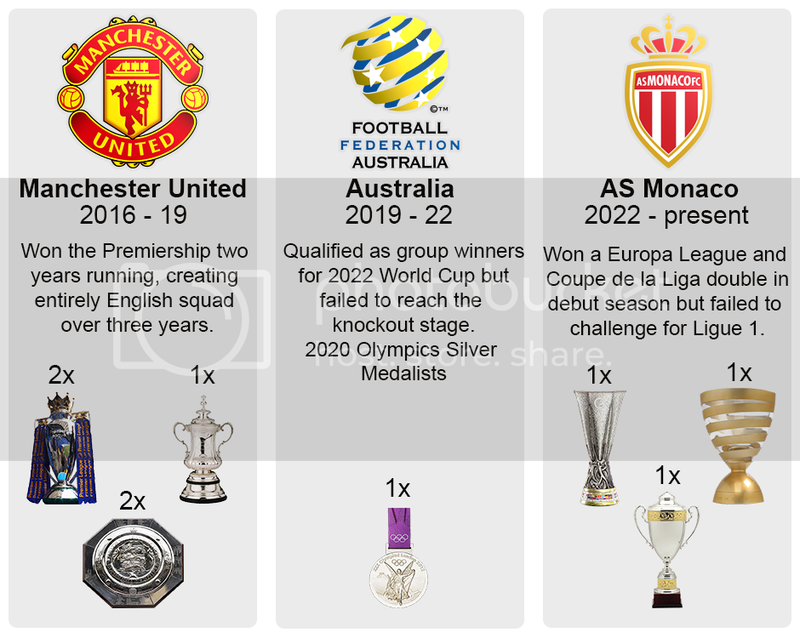 The 2018/19 season was a massive disappointment as our title defence never really got going, finishing in fourth place, a long way behind champions Arsenal and failing to collect any silverware. This led to me coming to the conclusion I had taken United as far as I could. After resigning my post at Old Trafford I was offered the job of Australia's head coach which I saw as a good opportunity to get some international experience in order to land the England job in the future. Things started very well, breezing through both qualifying groups for the 2022 World cup, however our performance at the tournament was sub-par as we failed to make it out of our group which consisted of Holland, Colombia and Austria. We did earn a silver medal at the 2020 Olympics in Japan, beating Brazil in the semi finals to set up a final against Belgium whom we defeated in the group stage, however this time the Red Devils were much improved, defeating us 4-0. Still second place was more than anyone had expected and was seen as a big achievement. 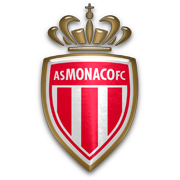 Following the World cup I resigned from Australia in order to return to club football, eventually accepting an offer from Monaco who were looking for a replacement for Zinedine Zidane who had just left to take on the French national team job. My first season yielded League cup and Europa League glory, beating Tours and my old side Manchester United respectively in the finals. However, despite a strong start to the Ligue 1 season we failed to keep pace with PSG, finishing 3rd, 23 points behind the Oil rich Parisians. Now just a few games in to 2023/24 the we have started brightly and are hopeful of pushing PSG harder this term, he have already collected some minor silverware, winning the Supercopa EuroAmericana (Europa League Vs Copa SudAmerica winners) against Brazilian outfit Vasco da Gama but were thwarted by PSG in the European Supercup in the same week, throwing away both a goal and man advantage to lose in extra time to our rivals. Cool little save you've got, always nice to beat a former team in a final! Here is a look at my current squad, it is a really exciting bunch of players with several wonderkids some of whom have both been purchased and some of whom are acadamy products. Jordan Pickford was one of my first signings as a manager as I spent £20M to buy him from Sunderland for Manchester United in 2016. Six years later I signed him again, this time for almost double what I paid the first time, such is my faith in Jordan who does a grand job as my first choice keeper. I also know I can rely on Dutch international Jeron Zoet who plays most of our cup and Continental games, including last seasons Europa League final. Italian U21 international Diego Cuiti is currently on loan at Galatasaray. He made his one and only Monaco start so far in the Coupa de France qauter final last season but I am sure he will make plenty more in the future. Jean-Luc Vergnes is the first of the clutch of wonderkids I've brought through our academy in the last two years, we are still working on making him the marauding wing back I ultimatley want him to be, however he is a very solid defensively and quickly turfed out the established Djibril Sidibe who I sold to the Chinese Super League last January. Kurt Zouma and Jemerson have been a brick wall centre back pairing, Danijel Novakovic is a highly talented 22 year old Serbian international who I would like to give more game time to, however with Zouma and Jemerson being so dependable his opportunities have been sporadic. Polish legend Kamil Glik is the club captain who has made well over 200 appearances for Monaco, however he is undeniably slowing down physically so I will likely be allowing him to leave at the end of the season when his contract expires. Mexian midfielder Neftali Montano has been by far my most shrewd signing, he cost me absolutely nothing when I snapped him up from Pumas on free transfer last January, he is now valued at £45M! We look more creative when he is in the team, rotating regularly with Serbian Dejan Nisic and Portuguese wonderkid Mario Cristiano in the deep laying playmaker role of my regular 4-2-3-1 formation. Brazilian Fabinho plays the role of ball-winning midfielder as well as vice captain of the club. Ahead of them are any combination of six attacking midfielders; Callum Gribbin is a former employee of mine from my Old Trafford days, I promoted him from the reserves on arrival at United, he established himself quickly as a first teamer there but my successor Jochim Lowe deemed Callum surplus to requirements and sent him out on several loans, including one to Toulouse last season where he was instrumental in helping them finish fourth and qualify for the Champions League. When the opportunity to sign him for nothing arose in the summer it was a no brainier for me, having him already knowing French was a big bonus. Belgian Adrian Bongiovanni was subject to repeated bids from Real Madrid in the summer, not surprising as he contributed 24 assists and 17 goals in 54 appearances last term, thankfully we have so far managed to keep hold of him. Maxence Huet is another wonderkid from the youth team who is establishing himself, Brian Fevre is yet another wonder kid whom was signed from Manchester City for a massive £59M last January. Argentine Jesus Gonzalez was another big money signing, costing me £35M from Bordeaux, he can play equally well either as a shadow striker of an out-and-out forward. Romelu Lukaku is a familiar name to any football fan, a powerful striker who is in scintillating form this season, scoring ten goals in his appearances so far. Benjamin Finkler was my only major signing this summer as I paid Wolfsburg £24M for their twenty year old hotshot, he has already begun paying me back with five goals in six matches which has caused me a selection headache between him and Lukaku to start as our attacking spearhead. Moussa Ba is yet another wonderkid whom I handed a debut to on arrival at Monaco, he too has been banging in the goals, bagging 27 in 34 appearances in all competitions last term (Including five in a 6-3 epic against Benfica in the Europa League Semi finals) This season hasn't caught fire for the 20 year old yet with just the one goal, though to be fair most of his game time has come from the bench. 17 year old Diogo Teles is right at the beginning of his football journey, making his debut from the bench last season during a injury crisis, he hasn't managed to find the net yet but I think the Argentine has a bright future ahead of him. Thanks mate, yes I'm. Enjoying it more than any save I've had in years now. , btw you images aren't working anymore - they were when I last left a comment but not now.